A luxurious feature offered on many modern ceiling fans is the wireless remote control. This feature offers full operation of the fan (and any light attachment) from any location within a reasonable distance. 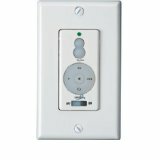 This can be especially useful in bedrooms, home theaters, and any other location it is beneficial to adjust the fan and lights without having to get up and operate a wall switch or pullcord. Unfortunately, remote controls also account for a fair number of problems with ceiling fans. Worse, solutions to these problems are usually not easily accessible. Now, in a little more depth, are some common solutions to remote problems. Each fan/remote combination is set to work on a specific frequency, much like tuning in a specifc radio station. Some fans allow you to set this frequency by means of a set of small switches called "dip switches". 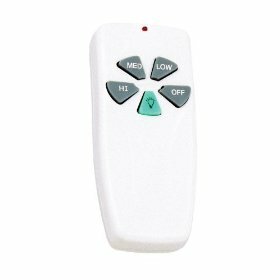 There is one set located inside the remote, and the other set would be position on the fan, with the remote receiver electronics. This would be either on top of the motor, or inside the switch housing or ceiling canopy. These switches "tune" the remote and fan (received) to the same "station" and therefore must be set to the same setting. If a fan is not responding to the remote you can check to make sure that the switches are set to the same setting in both locations, and/or try a different setting. They are also useful if you have two remote fans, you will want to be sure each fan is set different so the remotes do not interfere. 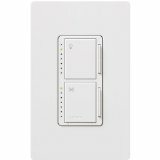 Lastly, if some other wireless device is interfering with the fan (causing it to turn on and off seemingly at random) such as a garage door opener or cordless phone, you can try a different setting on the dip switches. 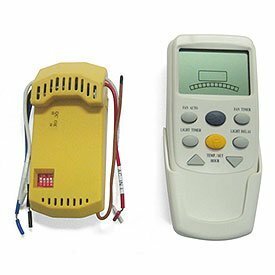 If your fan remote is lost or broken, many suppliers, including this web site, offer a universal remote designed to work with the majority of different remote operated ceiling fans. Many are also universal for operating televions etc so you can control all your leisure and comfort devices from one unit. Unfortunately, outside of Universal remotes, general replacement parts are not available for remote control systems. Your best bet is to contact the manufacturer. Also unfortunately, most problems with remote controls cannot be repaired outside of what is suggested above. If you have problems, contact the manufacturer, perhaps the fan is under warranty, or parts are available. Otherwise chances are the fan will stay broken. One common question: My fan's remote is broken, can I just convert it to a 3 speed pullchain like other fans? Again unfortunately, if you have to ask the question, then chances are the answer is no. It can be done but there are no universal directions, it varies drastically from fan motor to fan motor, and requires a fair amount of technical and electronic skill. A few exceptions: If the fan has a "remote bypass" switch you can select it and then use a wall control (or pullchain if there is one attached to the fan). Or . . . 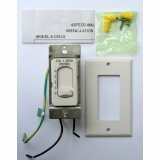 Some fan remote systems are not built into the fan, they were an option added by the installer at an additional cost. 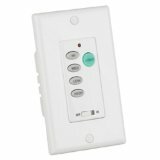 Usually they consist of a remote receiver wired to the fan inside the ceiling canopy, and the fan will still have a pullchain that is not used. If this is the case then the receiver can be removed and replaced with another remote/receiver kit, or the fan can be operated as standard with the 3 speed pullchain. My ceiling fan has six speeds, and I have lost my remote. I need to purchase another one and am having trouble finding one. 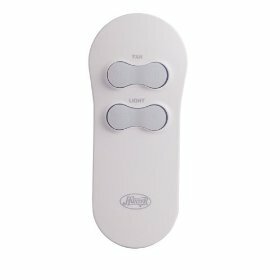 Where can I find a universal 6 speed ceiling fan remote? 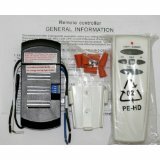 How to program a universal ceiling fan remote (or other) with a TV? How do I figure out my programming codes? These questions answered and more. Learn how to program a ceiling fan universal remote, or any remote really, with your TV set.